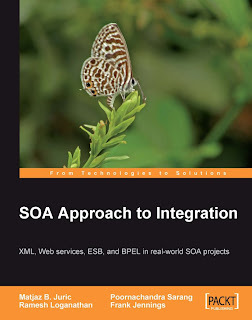 Last week i read the book "Soa Approach to Integration" (www.packtpub.com). This book is really excellent. It covers in nearly 360 pages all things you should know about SOA and it will provide you with examples, guidelines and historical backgrounds. If you are not familiar with XML, XSD, WSDL and BPEL you will get a tight introduction with many best practices. The authors came up with a very good balance of going in to details and coverage of different technical infrastructures like Java or .NET. If you are interested (and if you understand german), read my review at amazon.de. If you are not able to read german, you can read the reviews on www.amazon.com. In my opinion, everyone who is talking about SOA should know the content of this book! PS: The BPEL-chapter is based on Oracle BPEL PM and one of the reviewers of this book was Clemens Utschig, the SOA guru from Oracle!